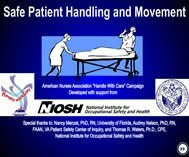 The Safe Patient Handling Training for Schools of Nursing has been released by the National Institute for Occupational Safety and Health (NIOSH). The material includes web-based training in safe patient handling and movement (flash media), as well as a downloadable .pdf booklet. This resource has been developed in partnership with the National Institute for Occupational Safety and Health (NIOSH), the Veterans Health Administration (VHA), and the American Nurses Association (ANA). The Canadian Medical Education Journal (CMEJ) is pleased to announce the publication of its inaugural issue. The CMEJ "is an online, open-access peer-reviewed journal exploring new developments and perspectives in the field of medical education from premedical to postgraduate and continuing medical education. We intend to publish research that focuses on the quantitative and qualitative aspects of prominent issues in the education, training and maintenance of health care professionals. Furthermore, the journal provides a forum for discussion specific to the challenges faced by medical education practitioners in Canada and internationally. Research in areas related to medical education including psychology, psychometrics, sociology, anthropology, linguistics, economics and other sciences is welcome. The target audience includes medical and medical education researchers and scholars, practitioners and professionals, universities and their students." Dentistry as it relates to medicine and nursing. Oral manifestations of systemic disease. The link between oral health and general health. Common dental problems in children. View video animation of a Dental Abscess.